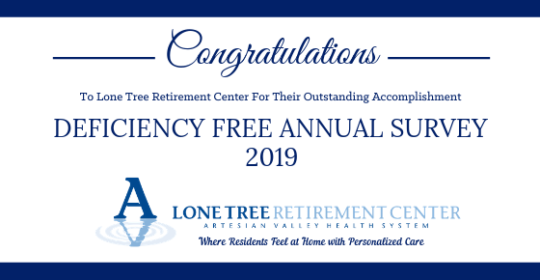 Artesian Valley Health System is pleased to announce Lone Tree Retirement Center has received a zero-deficiency annual survey from the U.S. Department of Health and Human Services (HHS) and Centers for Medicare & Medicaid Services (CMS). The HSS & CMS survey is performed annually at all long-term care facilities throughout the U.S. The survey is an intense review by state surveyors to check compliance with all federal requirements. It also helps ensure standards of service delivery and safety are met in the areas of Administration, Nursing, Resident Rights, Dining Services, and the Environment. A zero-deficiency result is the best possible survey score and we are delighted Lone Tree Retirement Center has received this accomplishment. We are proud of the care and environment the staff at Lone Tree provide for residents. For more information about the survey and requirements, please visit www.cms.gov. CONGRATULATIONS! This is awesome! Great team work! That is so awesome!! You have been so kind to my dad, John Loewen. Helping him to adjust to a new home and the loss of his wife He loves the food!!. Thank you Eileen for sharing this! We love getting to be part of his life and we’re so glad he is happy here at Lone Tree! Here at AVHS, you are more than just a patient or resident. You are our friends and family, and we love hearing from you! Share with us your thoughts, experiences, and ideas for future stories.